With the 2014 NHL Entry Draft still more than four months away, hockey fans might not be in gear to catch up on all of the draft-eligible prospects coming into this year’s festivities. However, that doesn’t mean that certain fans and enthusiasts can’t and won’t start digesting their draft information a bit earlier than others. Players such as Aaron Ekblad and Sam Reinhart are considered to be the cream of the crop of this year’s draft class and will likely be selected in this year’s top five picks. Although Ekblad and Reinhart have garnered serious attention thus far, the goalies that will be entering this year’s draft shouldn’t be ignored. Individuals such as Thatcher Demko, Blake Weyrick, and Alex Nedeljkovic will probably go into the 2014 NHL Entry Draft as some of the top-rated netminders available, but there are certainly a number of darkhorse goalies that could surprise many hockey fans in Philadelphia this year. Julio Billia might not be the top-ranked, or the biggest netminder out of the QMJHL, but he could certainly give goalies such as Mason McDonald a run for their money. So far this season, Billia has eclipsed the amount of games that he has played (26) for the Chicoutimi Sagueneens and has adapted well in his second season in the Q. While some might view Billia’s peripheral statistics (3.32 GAA, .900 Save Percentage) as not too enticing, fans shouldn’t forget that the league that the goalie plays in is very much offensively charged. Seeing as how Billia has had no problem playing on the international stage over the last two years – especially given his prowess in last year’s Ivan Hlinka Memorial Tournament – hockey fans shouldn’t be surprised to see an NHL team put stock into the young goaltender. With Mason McDonald, Keven Bouchard, and Julio Billia ahead of Louis-Philippe Guindon on the CSS midterm rankings, hockey fans might not be all too familiar with the Drummondville Voltigeurs netminder, but his play in the QMJHL can certainly attest to his belonging on the midterm rankings. At 6’1″ and 181 lbs., Guindon has an average frame, but has most definitely been contributing above-average results in the “Q” this season. With 44 games already under his belt this season, Guindon has registered a 2.63 GAA and .901 Save Percentage – which was an improvement over the 2.97 GAA and .891 Save Percentage that the Canadian netminder put up in 49 games last season. Seeing as how the QMJHL is renowned for having a fair amount of offensively gifted players, it is all the more impressive to see Guindon build upon his previous year’s statistics while shouldering quite a hefty workload as the Voltigeurs’ starting goaltender. Playing in his third season with the Erie Otters of the OHL, Devin Williams has shown significant improvement in his most current hockey season. Much like Paulic, Williams is a bit of an undersized netminder as he is slightly under six feet tall, but William’s undoubtedly has to fill out his frame a bit more over the next couple of season as he was listed at 165 lbs. in CSS’s midterm rankings back in January. Despite Williams needing to fill out his frame, that hasn’t stopped him from having a very successful OHL season thus far as he has appeared in 26 games this season and has recorded a 2.57 GAA and .906 Save Percentage. With four shutouts amassed during his most current OHL season and with the Otters firmly entrenched in a playoff spot, Williams will have many opportunities to showcase his talent for the remainder of the OHL regular season as well as the postseason. Much like Kasimir Kaskisuo and Austin Lotz, Nagelvoort will be one of the older netminders available in this year’s draft. 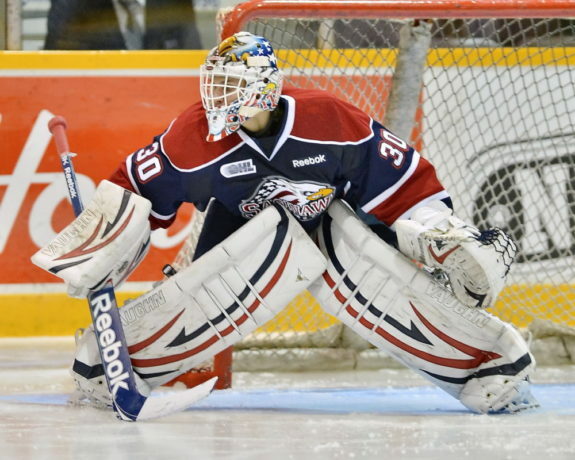 While Nagelvoort is an older product that was draft-eligible in the past, the goalie has been extremely consistent despite playing for six different teams (Kalamazoo Jr. K-Wings, Traverse City North Stars, Soo Eagles, Aberdeen Wings, Green Bay Gamblers, University of Michigan) over the last three years. Throughout his career in the NAHL, Nagelvoort never had a GAA above 2.68 and a Save Percentage below .921 – and much of the same patterns have continued for the goalie at the University of Michigan. As a member of the Wolverines, Nagelvoort has played to the tune of a 2.26 GAA and .927 Save Percentage in 20 games and could very well be an off-the-radar goalie for this upcoming draft as he has shown that he has the drive and work ethic to be a successful netminder regardless of his level of play. Matt Mancina received a no. 18 midterm ranking by CSS in January, and the goalie has certainly been playing lights out in order to earn such a spot. Mancina has seemingly made a flawless transition from the GOJHL to the OHL this season as the goalie has 2.37 GAA and .921 Save Percentage in 21 games played for the Guelph Storm. Although Mancina might be a bit light (172 lbs.) for his 6’1″ frame, he has shown that he has the necessary skills to succeed and compete while he continues to develop physically. With Justin Nichols entrenched as the Storm’s starting netminder, Mancina will likely have to wait a little while before he can take over starting duties in Guelph. 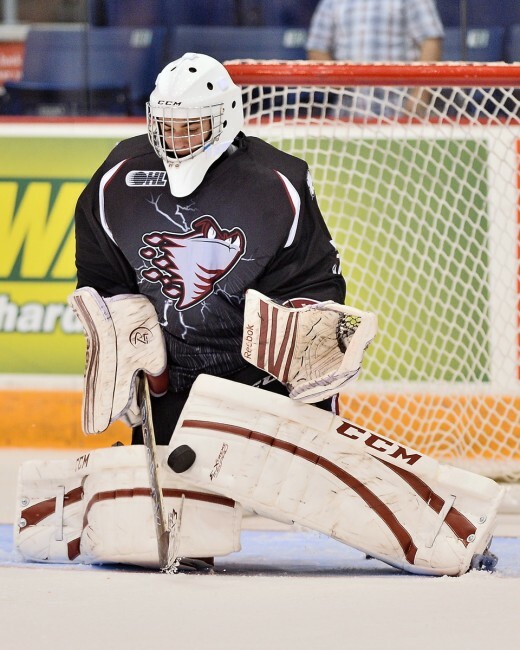 Regardless of Mancina’s role with the Storm going forward, hockey fans should definitely keep an eye out for the young goalie in late June as he has certainly garnered attention amongst scouts and fans alike. Brassard is a goalie of average height (6’1″) and will need to add on some weight in the long run as he is among the lightest goalies available in this current draft class, but the goalie played his way onto the midterm rankings in January. While Mason McDonald got off to a hot start when the Acadie-Bathurst Titan traded him to the Islanders, Brassard continued to put forth solid efforts and didn’t let the roster shake-up affect him – something that might just open the door for the goalie to potentially make a jump in the final rankings. In 37 games played for Charlottetown, Brassard has registered a 3.44 GAA and .905 Save Percentage, which are pretty serviceable numbers given the fact that the goalie plays in the offensively charged QMJHL. If Brassard closes out his current QMJHL season on a consistent run, then his draft stock will undoubtedly increase as he is currently making quite a strong case for consideration amongst the “lesser-known” draft-eligible North American netminders. At first glance, Justin Paulic’s statistics might not impress hockey fans, but there is more than meets the eye with the Canadian netminder. Standing at a shade over 6’0″, Paulic might not have the typical height that NHL teams might be looking for in a goalie, but that shouldn’t be a determining factor when looking at the goalie. Over the last two seasons, Paulic has appeared in 106 games for the Warriors and has been a constant in the Moose Jaw crease. Although Paulic has recorded a GAA north of 3.00 and a Save Percentage south of .900 over the last two years, one should also remember that a goalie’s statistics can take a hit when they receive as much of a workload as Paulic has had in each of his last two campaigns. Considering the fact that the Warriors are a relatively young team – and the superb job that Paulic has done holding down the fort while his team goes through natural ebbs and flows – it would be hard to dismiss the goalie’s body of work by purely looking at his statistics. Playing in the BCHL, Alec Dillon has been very impressive in the 20 games (2.47 GAA, .918 Save Percentage) that he has played for the Victoria Grizzlies. Even though Dillon was ranked no. 26 in CSS’s midterm rankings, he is a tall (6’4.75″) and lanky netminder that NHL teams would absolutely covet. Despite the fact that Dillon has a frame to fill out, the upside for the young netminder cannot be mistaken by anyone. According to Robert Ward – a scout for the New York Islanders – Dillon has good hands and rebound control but could use a little bit of work on his lateral movements. Dillon will certainly have aspects of his game that he will have to fine tune over the next several years, but if the goalie continues his solid play with the Grizzlies for the remainder of the BCHL hockey season, then the big goaltender will likely be a very good darkhorse option for hockey fans to follow coming into draft day. Much like Alec Dillon, Landon Bow is a tall netminder that will probably garner attention for the NHL Entry Draft, at least in part, due to his size. Unlike Dillon, Bow is the second heaviest goalie available in this draft as he weighed in at 214 lbs. for CSS’s midterm rankings, which placed the goalie at no. 29 overall. Not only has Bow shown improvement from his previous season in the WHL, the goalie has shown that he can perform when given added responsibility. As a member of the Swift Current Broncos, Bow has recorded a 3.16 GAA and a .901 Save Percentage this season. Even though Bow’s peripheral statistics might not be all too attractive, the goaltender will nonetheless draw the attention of scouts between now and the 2014 NHL Draft as he seemingly has the size and raw talent to be a very interesting prospect in late June. Hayden Lavigne (no. 15 overall CSS ranking) has already verbally committed to the University of Michigan for the upcoming NCAA hockey season, and there is ample reason to be excited about the prospects of this netminder. While Lavigne has been struggling in the USHL this season (18 GP, 4.19 GAA, .883 Save Percentage), the goalie stands nearly 6’3″ tall and weighs over 180 lbs. With Lavigne filling out his frame quite nicely already, he will likely attract a good amount of attention as one of the bigger netminders in this draft. 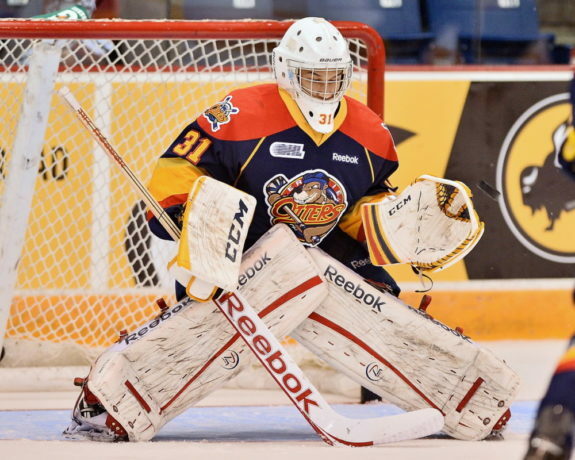 Nikita Serebryakov hasn’t exactly had the smoothest of transitions to the OHL over the last two seasons, but the goalie has been showing progress this season. In 24 games played this year, Serebryakov has lowered his GAA to 3.65 and increased his Save Percentage to .895. Even though the Russian netminder doesn’t have the most appealing statistics at this point in time, his improvement this season should be seen as a positive sign. Serebryakov wound up being ranked no. 17 overall on CSS’s midterm rankings in January, but the goalie will need to maintain a level of consistency if he hopes to keep his ranking and draft hopes alive. Sean Cleary might be playing for Lake Forest Academy, but he shouldn’t be ignored heading into the NHL Draft. Cleary stands almost 6’3″ tall and weighs over 180 lbs., – so he already has the size that many NHL teams are looking for in a prospect goalie. Cleary hasn’t had a huge sample size of games (22 over the last three hockey seasons) to judge him by, so it is hard to tell exactly what NHL teams could expect to get from the goalie despite a good showing on his peripheral statistics. Cleary was ranked no. 15 in CSS’s midterm rankings, but it is yet to be seen if the goalie will convince an NHL team that his body of work thus far has proven him worthy of being drafted.